Understanding the menu selection on reports. Print Manager Plus reports have a large menu selection to choose from. Here is a graphic and definitions for each selection and function. Date Selection – This drop down menu allows you to pick custom dates or choose a preset timeframe. 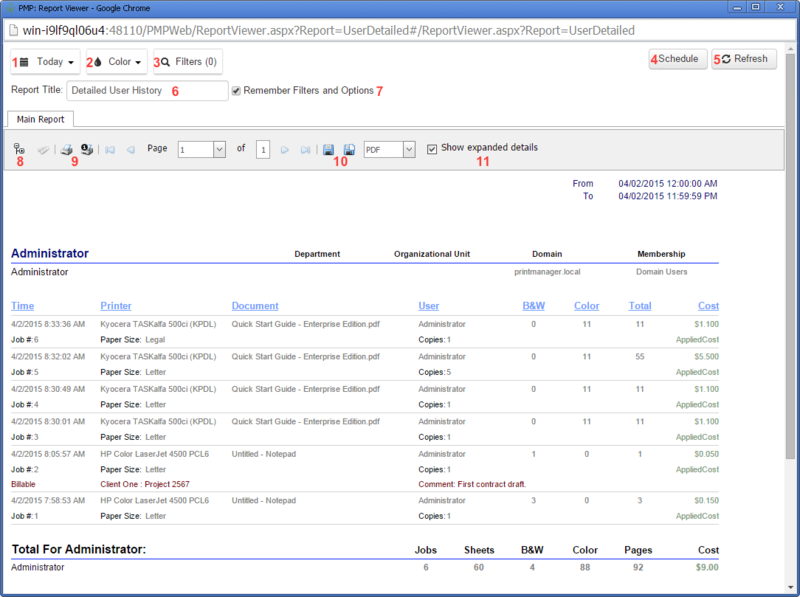 Color – This function allows you to filter the report by only print jobs that have Color or B/W or both. Filters – Allows you to filter your report by Users, Domains, User Groups, Printers, Page Sizes and Job Titles with many other filters under each option. Schedule – You can schedule a report to be set to automatically emailed or saved to a share. Refresh – When you make a time change you can click the refresh button to show the change. Report title – Change the title of the report for printing, exporting and scheduling. Remember filters and options – Once you make a change through filters you can select this to keep the filter when you open the report later or for scheduling to deliver via email or to a share. Document map – Show or hide the document map of the details of what is being reported on. Print – Print the report. Export report – Save the report as a .PDF, .XLS, .XLSX, .RTF, .MHT, .HTML, .TXT, .CSV, .PNG. Show expanded details – Clicking this will open up the details of the individual print jobs revealing detailed data. How to schedule a report for delivery via email or share.